Choose one of these topics to write your essay on. Write a minimum 2.5 to 3 page paper on the subject. Please follow MLA-style guidelines when formatting your paper and use APA style for citations. Paper 3 will have two due dates: Monday, November 21 and Monday, November 28 (after Thanksgiving). You may turn in your paper on either of those two days and receive full credit. There will be no journal entry due next week. Analyze one game from this section in depth. Examine in particular the designer’s background and his or her approach to the subject matter, as well as how the game’s themes are communicated through gameplay, art, story, and other components. Answer questions such as: What is the artist’s intent? What elements of the design further his or her goal? How did the designer construct particular elements in the game to effect the player emotionally? Explore the influences Team Ico, Jordan Mechner, and Eric Chahi have had on each others’ work. How were these artists inspired by their colleagues’ work, and how have they built on each others’ themes and ideas? You may also examine the impact their work has had on other artists and designers (such as Team Ico’s influence on Tale of Tales). Explain how Braid utilizes a series of intertwined themes and layers to ‘braid’ together strands of narrative and meaning to create a very dense, impactful game. Jonathan Blow stated that while most people got something out of Braid, few people got everything out of it. How do players unravel each strand of its meaning? What is required to gain a more complete understanding of Braid? Explain the atomic bomb reading of Braid. How integrated is it into the game? Do you agree with this interpretation? Why or why not? Explain the concept of flow. Examine the use of flow in one of Jenova Chen’s games and compare it with one other game we have played this semester. How important is flow to this other game? You may also compare the game flOw with Cloud or Flower to explore different methods of attaining flow in games. Most of the games we examined in this section are commercial products: they are ultimately designed to be sold. We have also seen the work of Tale of Tales and Daniel Pinchbeck, who are both interested in creating a sustainable financial system that will allow them to devote all their resources to making art. Team Ico, thatgamecompany, and Jonathan Blow have demonstrated how artistic games can be commercially successful. What differences do you see between commercial and non-commercial art games? What impact do you feel commercialism has on the development of art games? For Week 14, we will examine Fluxus, a 1950s and 60s art movement that experimented with games and play. This week, we will be examining the works of That Game Company, a group of talented designers that came out of the University of Southern California. TGC’s work revolves primarily around the theory of Flow, which we will be looking at as well. On Wednesday, we will be looking at Flower and hopefully manage to play the entire game in class. If you have a copy of this game, you are encouraged to play through it prior to class. Or, if you have a PS3, you are encouraged to purchase the game, though this is not required. Flower (PS3, 2008). That Game Company, Sony Santa Monica Studio. This week, we will be playing through Braid. Note that you will play through all the levels, but you do not have to solve all the puzzles. Braid takes about 6-8 hours to complete, but that’s if you solve all the puzzles. For Monday, you should have played through the first six levels of Braid, to get a feel for the environments. For Wednesday, make sure you have played through the ending and final level (you can use the save file if needed). A walkthrough for the individual pieces you get stuck on. Note that AppData is a hidden folder. Use the instructions to figure out how to view hidden folders. Braid (PC/Mac, 2009). Jonathan Blow, Steam. Next week, we will cover the works of Team Ico, one of the most imaginative and poetic design teams, lead by Fumito Ueda. If you have a copy of Ico or Shadow of the Colossus, you may want to play those instead of watching the videos. Note we will be discussing the endings to both games, so make sure you’ve played through the whole way. Shadow of the Colossus (PlayStation 2, 2005). Team Ico, Sony Computer Entertainment. Essay questions are due Wednesday, November 2. There will be no journal entry due next week. Late papers will be accepted no later than Monday, November 7 for a single letter grade deduction. Compare two games with similar themes. For instance, you could compare the use of player choice in Every Day the Same Dream with that in The Stanley Parable, or you could compare the approaches of Robert Yang (Radiator) with that of Dan Pinchbeck (Dear Esther). What can we learn about games or these two particular games’ source material based on their different approaches to the same topic? Analyze one game we covered in more detail. Answer questions such as: What is the artist’s intent? What elements of the design further his or her goal? How did the designer construct particular elements in the game to effect the player emotionally? Several of the games we looked at such as The Graveyard and Another World look as if a they could be shown as video. We were also unable to play other games such as Waco Resurrection. In some cases, walkthrough videos were used when playing the game was not an option. What elements of these games is lost when the game is watched rather than played? What elements does interactivity add to the experience? Tale of Tales expresses their interest in having the player create his or her own meaning from their work. Their works such as The Graveyard and The Path can be very personal to the player, and two players are likely to draw from the game vastly differing – yet, as Tale of Tales argues – valid interpretations. At the same time, Tale of Tales hesitates to release any specific interpretation of what they had intended when making the game or how they interpret the work. How does Tale of Tales encourage a diversity of conflicting, yet valid, interpretations in their work? Games have traditionally been viewed as forms of entertainment used for such purposes as enjoyment, recreation, or relaxation. Katie Salen & Eric Zimmerman’s definition of game we have been using throughout the semester: “A game is a system in which players engage in an artificial conflict, defined by rules, that results in a quantifiable outcome.” Super Columbine Massacre RPG!, The Stanley Parable, and The Graveyard are games that challenge our traditional definitions of what games are and what games can be. Pick one game from this unit that has challenged or altered your views on games or that has challenged traditional definitions of games. Explore in more detail the body of work produced by an artist we covered. What themes and styles do you see explored within the artist’s work? How does the game we covered express certain aspects of those themes or philosophies in particular? Good choices for this are Dan Pinchbeck (Chinese Room), Tale of Tales, and Molleindustria. For Week 7, we will be exploring two different approaches to narrative in games. The first is a critique of how narrative is used in games. The Stanley Parable is another mod for Half-Life 2. Install it the same way as the previous ones. The homepage has downloads for both OSX and Windows. The second, Every Day the Same Dream, is a critique of choice in games. 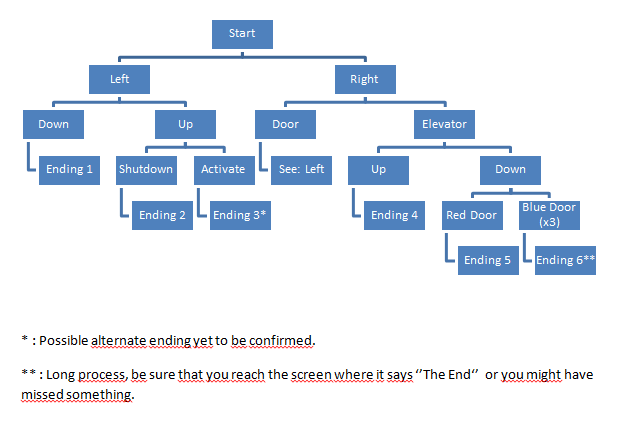 There are six endings to The Stanley Parable. Play through all of them. (If you get stuck, use this map). Play through the entirety of Every Day the Same Dream. If you get stuck, use the walkthrough. On Wednesday, we will look at Karateka and Another World. These are two games that use a cinematic style for 2D storytelling, as opposed to the 3D style used by Tale of Tales and others. They were also inspirations for Team Ico, which we will be looking at the week after. We won’t be playing Karateka, just watching a video. This is because the only legal download is for the PalmOS, which is uncommon. Another World we will play, but how much you want to play is up to you. You can either play the demo or the full version. If you get the full version, Another World will take around 2-3 hours to play through. Play through at least one hour’s worth of material. If you get stuck, feel free to use this walkthrough or watch a video. There is also a demo on the homepage. If you get the demo version, play through the whole demo. Tip: Press down + attack to kick the slugs. It is much easier than jumping over them. Reden, Davey. (2011). “Author Commentary.” (Text document included with the mod).